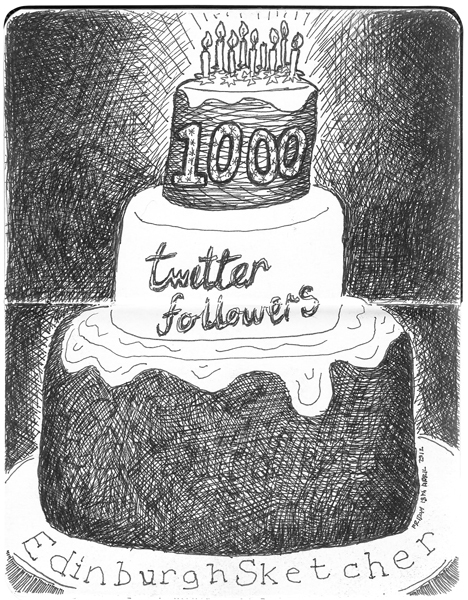 Congratulations to EdinburghSketcher, now with over 1000 twitter followers. Thanks to everyone who is keeping up to date with my Edinburgh sketch blog. And with all those candles the future is bright, with more competitions and prizes to come (starting today) so please keep watching and help spread the word. So good luck, and I’ll pick a winner on the 1st June 2012. Although I love the one of James and Zoe drinking their milk in costa coffee in their buggy I decided to pick the one of Pilrig House. It looks very peaceful and I love the old gentlman haveing a wee stroll through the park. I want to do Mary Poppins and jump in. Was their a carasel in the distance? Ace acers please it is just beautiful! Fingers and toes are know crossed. Ace Acers in Trinity. Ace! Thanks Anna, Nadya and David, some great choices there. I’m glad you enjoyed the Hearts victory on the other side of the world Anna! Oooh, it’s a tough choice, too many to pick from that I only managed to whittle it down to my favourite two. My favourite sketch (apart from the Kindy one for obvious reasons!) is Heartsbus…a big family moment in our household as Dad, Kevin and wee Archie celebrated the Hearts win together! For me, it has to be “Queen Mary’s Bath House” as my all time favourite. I can almost feel myself standing opposite it staring at the House in awe. Thanks Jonathan and Jonathan! That’s two for Winter Wonderland, I do love the way Edinburgh looks at Christmas. Good luck in the FREE PRINT GIVEAWAY! Love the website. We became engaged in Edinburgh so lots of fond memories! Love Winter wonderland 2b – great work! It has to be Winter Wonderland,love this sketch,makes me really look forward to Christmas!! from East Market St, over the North Bridge and onto the The Balmoral. Thanks Mike, yes it’s amazing how quickly the galleries fill up! Good luck with the print giveaway, I like that one too. Amazing body of work! Could send all day looking through your galleries! My favourite is ‘The Radical Road’, 3rd March 2012 from the Daily Sketch gallery! Too many to choose from!! Got down to 3. Any of those 3 would b amazing! I love this http://edinburghsketcher.com/2012/01/23/wherearti006/ – hoping to win! A windy day for Peter and Paula.. I really like these characters and drawings, they make me smile. Hope they made you smile when drawing them in the Western. Congratulations! Thank you so much for the chance to win a print! Inverleith park, gallery 2, Jan 7 2012. If my name is picked for the give away, please surprise me. I really can’t decide between the two. Thank you so much for your generous offer! Late Day Sunshine. (Gallery 3).